Naldurg was a must-do point on my Solapur Trip. 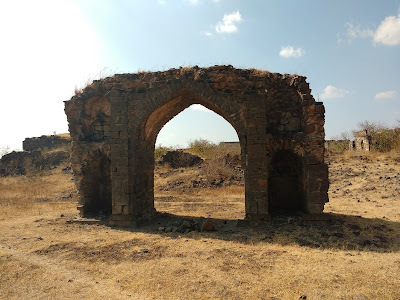 Naldurg derives its name from Nala Raja who built the initial fort. 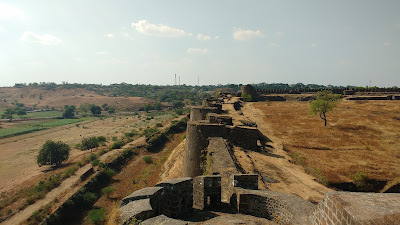 The fort was later captured and considerably expanded by the Adilshah of Bijapur. 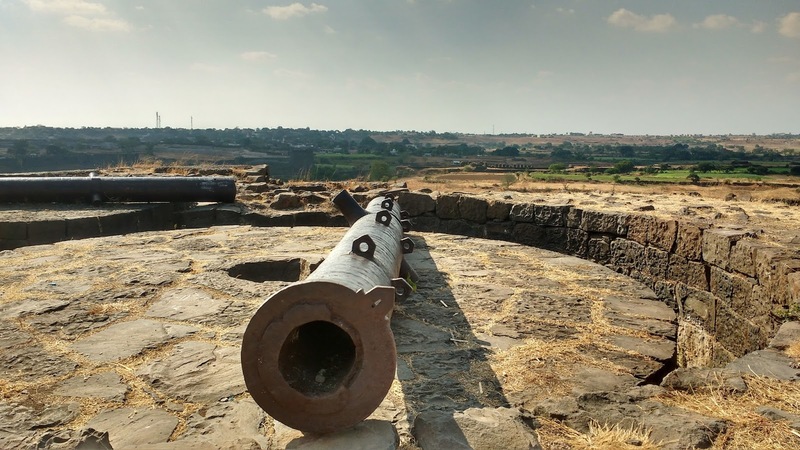 Today, the fort enjoys the status as the largest land-fort of Maharashtra. 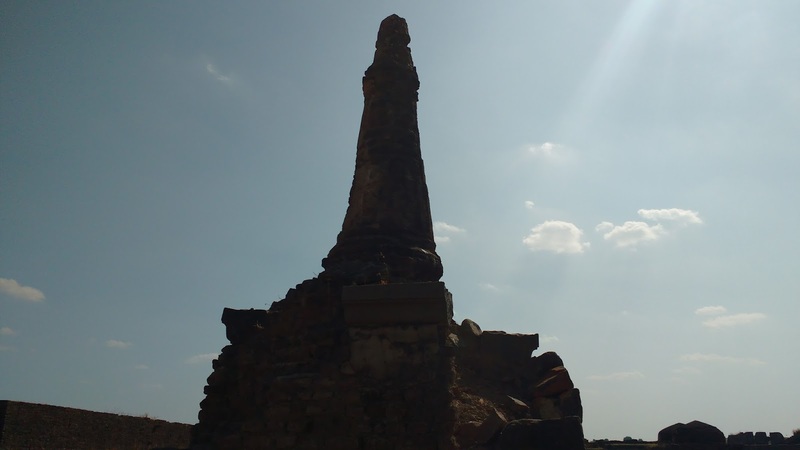 Naldurg, like Tujlapur, lies in the Osmanabad district, bang on the Solapur-Hyderabad Highway. 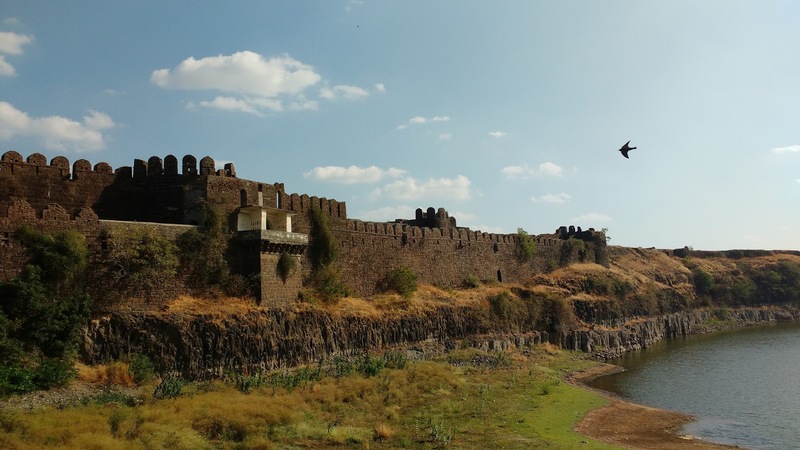 It is located at a distance of 36 km South of Tuljapur, 45 km East of Solapur and is accessible from both these places by public transport. 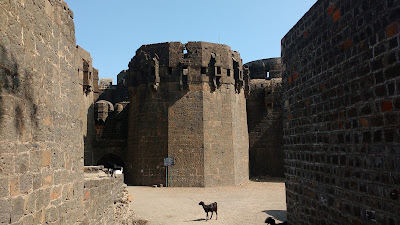 I had scheduled Naldurg after Tuljapur and arrived here in style in a battered old Mahindra Jeep filled with 20 people. The fort is about 15 mins walk from the bus stand of Naldurg. 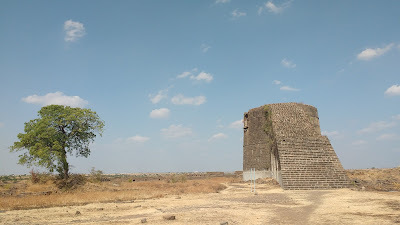 The first entrance of the fort is flanked by two huge bastions, but does not have a gate. The old moat that surrounds the fort is also patched up at this point to facilitate entry. 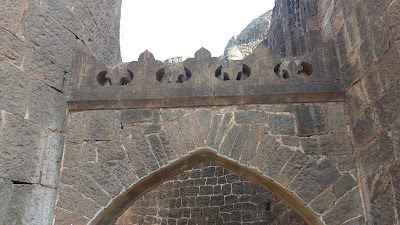 Inside this entrance one has to pass through a long wide passage flanked by high smooth walls and port-holes on both sides till one reaches the Hatti Darwaza (elephant gate). The passage is in mint condition, but access to higher sections of the walls have been sealed off. The Hatti Darwaza, today serves as an entry-exit checkpost. A Rs. 2 ticket is charged per individual, plus Rs. 10 for photography. 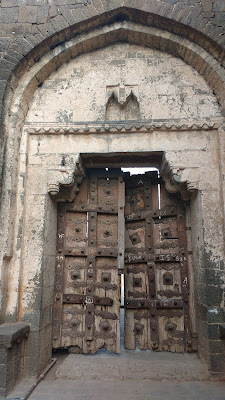 The Darwaza is opened just enough to let one man in at a time. It is a bit difficult to get in with a backpack. there's a list of 'donts' on this fort that one can mostly not pay attention to. 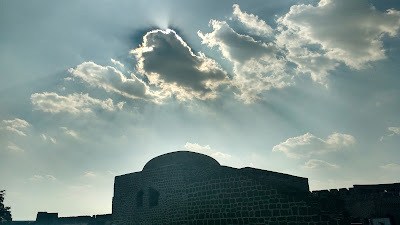 The best time to visit Naldurg is in the monsoon. I was about 5 months late (considering the dismal monsoon of 2015). Except for a few tamarind trees and a far-off masjid, there was not a trace of green anywhere as I saw from the entrance. Everything was a dry and dusty shade of yellow. The fellow who took the money for the entry was a nice chap and directed me from his mental map. I noted the directions. First stop was the Raj Mahal. A curious aspect of this fort is the river Bori which passes through. There is a check dam on this river and also the Pani Mahal - more on those later. The Raj Mahal has a balcony which opens to a semi-circular riverfront view with the Pani Mahal and check dam completing the panorama on the other side. Next up was the Nav Buruj. This peculiar bastion is a beauty in itself. This bastion has nine semi-circular sub-bastions arranges in an arc. What one sees from the front is like a nine-faceted tube extending about 200 ft. in height. the front view can be seen from the highway - I could only see the top view. 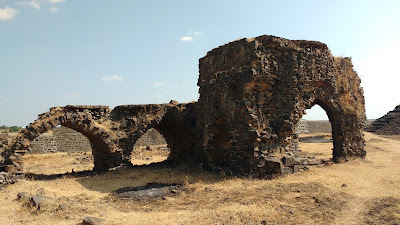 There is a mausoleum-like structure on the way to this bastion and a couple of other ruins with some nice stucco work. 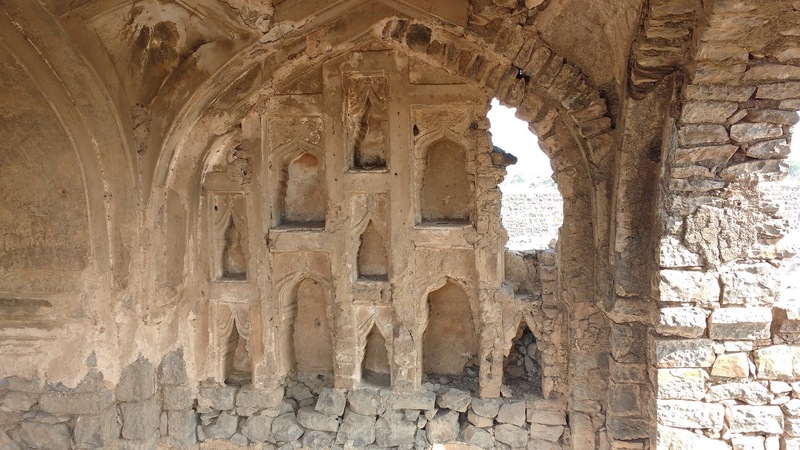 A mausoleum - why does one seek to be immortal in stone, rather than in thought? Upali-Buruj, the highest point of the fort, came next. 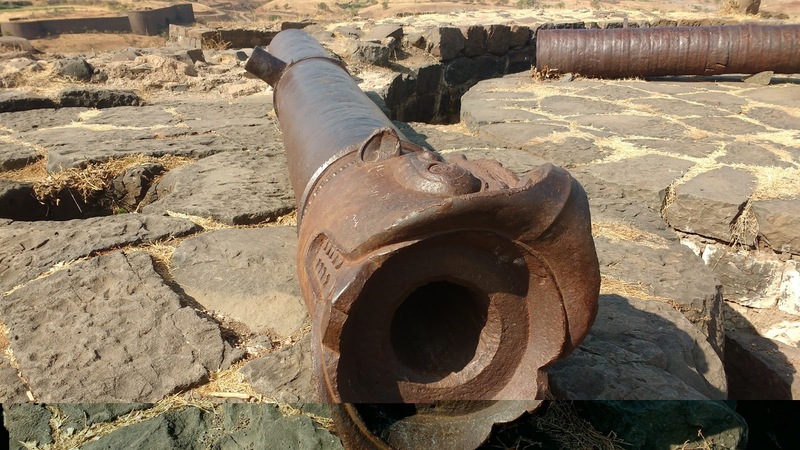 This bastion has a straight flight of 77 stairs to access the top where one can see the Magar (Crocodile) and Hatti (Elephant) cannons. There seem to be a few rooms inside the bastion, but I did not see a way to get in. Next to the Upali Buruj is the Pani Mahal. 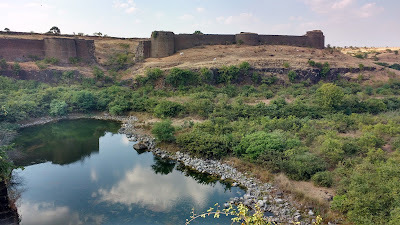 The river Bori passes through the fort and has been blocked here by a check-dam. The dam overflows every year during monsoon in two waterfalls. There was none waiting for me. Even then there was enough water in the check dam to interest a flock of birds, who seemed to have their own fun here. This area was quite green too. The Pani Mahal, today however, is just another balcony to enjoy the view. I returned to the main gate aiming to head back to Solapur. I had spent close to 2 hours on this 116 acre fort and was starving. Here, providence decided to throw in a silver lining - a literal silver lining on a literal dark cloud. That's it though - no food. That might change soon though, since the maintenance work on this fort is now being taken over by a private company from Solapur on a lease of 11 years. Hoping for the best. I got a Maxximo ride back to Solapur and was back in an hour. The total expenses were Rs. 30 for the Jeep ride, Rs. 40 for the Maxximo ride and Rs. 12 for the entry. Seeing so many pics of this fort for the first time! I have to visit some day. Indrani ... the best time to go is now - the month of September!